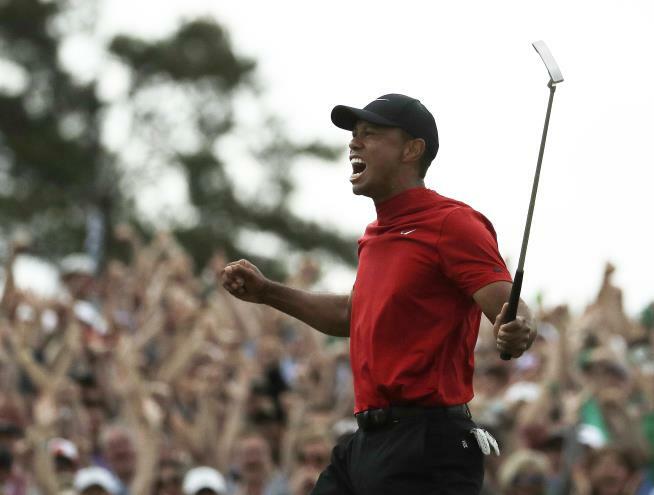 (Newser) – Tiger Woods' stunning Masters win in Georgia on Sunday was a great day for the golfer and for anybody who can't resist a good comeback story—but a lousy day for bookies. A customer betting with William Hill in Las Vegas won $1.2 million with an $85,000 bet on Woods at 14-1, ESPN reports. "Pretty good first bet," says William Hill exec Nick Bogdanovich. He adds: It's great to see Tiger back. It's a painful day for William Hill—our biggest loss ever—but a great day for golf." This is believed be just the fourth time the company has paid out seven figures in the US. The previous three were all for large bets on the Eagles beating the Patriots in the Super Bowl last year. Other bookies also lost big-time, including FanDuel, which says it is out more than $2 million, NJ.com reports. Man, i wish i had $85,000 to play with in the first place. Two weeks from now: "In The News: Tiger Woods Suffers Fatal Heart Attack...."